Both structures are supplied by the lateral lenticulostriate arteries, which originate from the MCA. The caudate nucleus is also supplied by the medial lenticulostriate arteries, which arise from the ACA. The recurrent artery of Heubner, which supplies the anteromedial caudate nucleus and the anteroinferior internal capsule, is the largest of the medial lenticulostriate arteries, and originates near the anterior communicating artery. 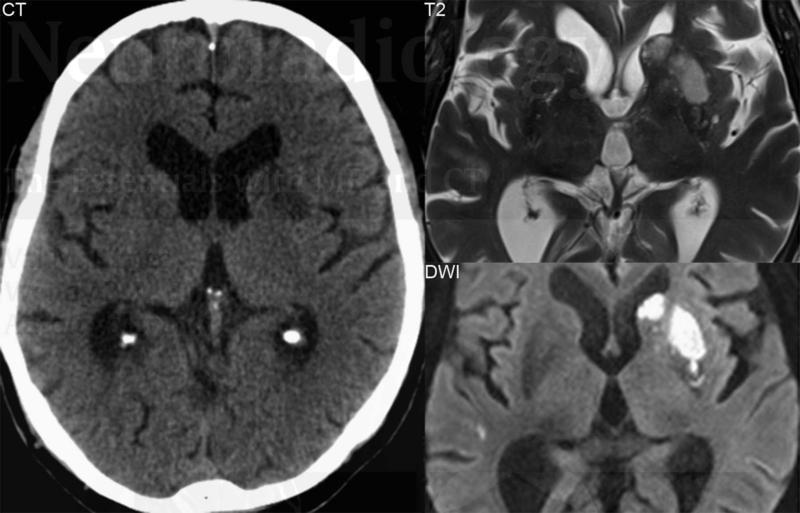 This acute lacunar infarct is better visualized, in terms of the specific region involved, on MR. The infarct manifests both vasogenic and cytotoxic edema.